The Department of Community & Public Health at UNM-Taos is excited to be recruiting a new cohort for our nine-month Certificate degree program in Community Health,beginning Friday September 7, 2018. The program provides trainees with a foundational set of knowledge and skills aligned with industry-recognized standards. 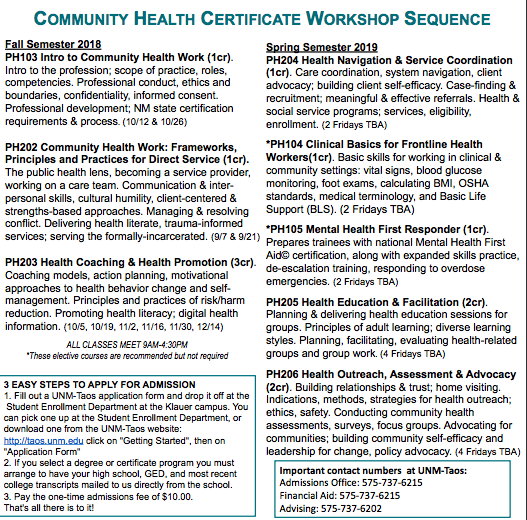 It is fully-endorsed by the New Mexico Department of Health, and completion of the program confers graduates with eligibility to apply for state certification as a Community Health Worker (CHW-C). It offers an excellent opportunity for employers to provide low cost, high quality community health skills training to staff. Financial aid is available for students who qualify, and the program is open to dual enrollment students. A flyer with program details, course dates, and enrollment information is attached. Courses can be taken individually, our as part of the complete degree program. Known by many names - including Community Health Representatives, Outreach Workers, Health Navigators, Home Visitors, Health Advisors, Family/Peer Advocates, and promotoras de salud – these and over 100 job titles align under US Department of Labor's occupational code for Community Health Workers (see attached 'Job Titles for CHWs' for a complete listing). CHWs are frontline health workers who are trusted members of the communities they serve. They bridge critical access, cultural, linguistic, and other gaps in health and human service systems. They have had great success in increasing access to care, improving chronic disease prevention and control outcomes, delivering educational programming, improving health literacy, advocating for communities, and assisting clients in accessing and navigating complex processes and systems. CHWs can be found working in health and human service organizations, schools, non-profit organizations, and faith communities, and have deep roots in the diverse communities and cultures of New Mexico. UNM-Taos was the first college in New Mexico to offer a credit-bearing, standards-based, nationally-aligned training program for CHWs in 2010. The curriculum has been newly updated and redesigned into a Certificate Degree in Community Health. The 10 credit-hour degree consists of 6 short courses organized into series of experiential workshops that meet several Fridays a month, for two semesters. Two elective courses are available as well (Clinical Basics, Mental Health First Responder). As a certificate degree it can stand alone, it can serve as a professional credential added to an existing degree, or be an educational gateway to a host of health and human service training programs and careers. Program instructors are masters-prepared professionals who are seasoned practitioners of the competencies they teach at an advanced-practice level. Their perspectives as CHW trainers are informed by their experiences working as, with, and supervising CHWs on clinical and community health teams. An advisory committee of senior CHWs and CHRs provides valuable guidance to the program, and also serve as community preceptors. I would be happy to discuss our program more with you. Thanks for your interest, and please do share with your networks.